Mark 10:13-16 provides a clear picture of how Jesus relates to children and what we as parents need to be sure to do in order to connect with our kids. Three unchanging principles of quality relationships was the focus of the second installment of the Parenthood series at North Ridge; touch, time, and talk. Number one, affection through appropriate physical touch. A pat on the back, a hug, a fist bump, rocking a baby to sleep. Positive physical touch creates a secure environment and a bond of trust between parent and child. Second, the time we spend with our children communicates their place on our list of priorities; be it good or bad. A child who is consistently told to “wait”, “let me get this done first”, “after the game”, “maybe tomorrow” quickly learns that whatever is occupying their parents’ time is more important than they are. The child who watches his father drop what he’s doing to get on the floor and play with them knows they can always count on their dad to be available to them. Third, talk to your kids. I don’t mean a shallow “How was your day?” “Good” and that be the end of it. Encourage your kids. Have deep conversations with them. I’ve had extensive conversations with my then 3 year old because he wanted to know why ‘sugar’ is not spelled with an ‘sh’. All it takes is a little time and attention from you toward your children to build strong, intrinsic value for them and a relationship that will open doors for you to walk through life with them, but it will not happen over night. In the image that came from this, I first drew the parent and child in the top left. This is my favorite image of prayer as proposed by Brennan Manning. Manning compares the time we spend with God in prayer to that of a toddler with his father. Toddlers are extremely affectionate but also easily distracted. A young boy may run to his father squealing “Daddy home, Daddy home” and be scooped up by his dad’s arms only to turn around and point to the toy fire truck on the carpet. The fact that a bright red piece of plastic grabs his son’s attention does not bother the man, he is content holding his son who celebrates the fact he came home. God is the same with us. We may find words difficult to come by when we pray, become distracted by tomorrow’s to-do list, or even fall asleep as we are praying but that doesn’t grieve God because we are still spending time with Him. The bottom of the page shows another stage of touch and time, letting go. At some point, the time we have to daily pour ourselves into our children is over and we must let them go to do life. This doesn’t mean permanently out of our lives, but not around on a daily or possibly even monthly basis. Drawn over both of these images is an arm with a watch and an open hand. The watch symbolizes our limited time and our tendency to watch it tick by. We live by schedules, we plan on what’s going to happen when and where. 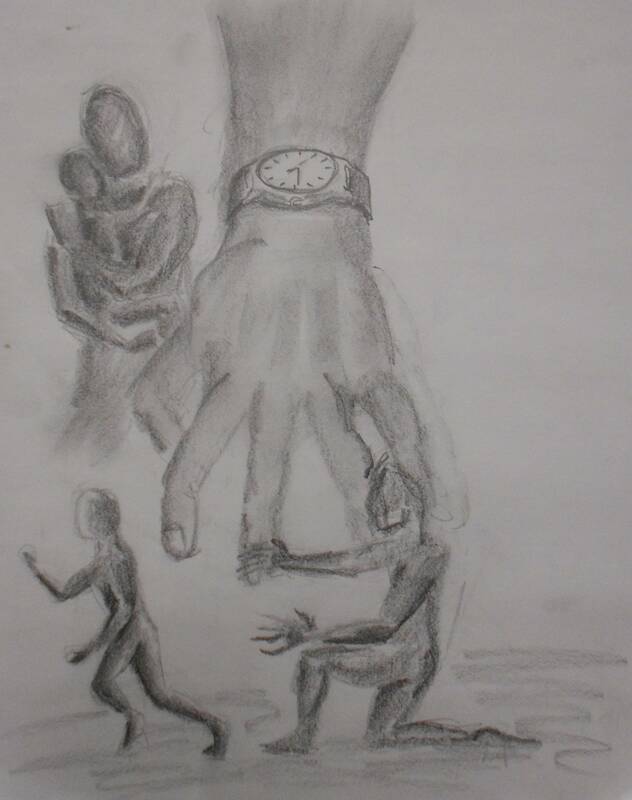 The hand reaching down posed in a way that comes across as a little disturbing, almost creepy, like it’s attempting to grab up the parent figure on the bottom. That’s precisely correct. The arm is straining toward the day of letting go in hopes of prevent it from happening, attempting to sweep back time so they can get to know their child. I believe this occurs all too often. Parents spend their lives building the perfect environment for their kids then wake up to realize, a day too late, they barely know each other. Touch, time, and talk. Invest them all in your children as if there is no tomorrow.